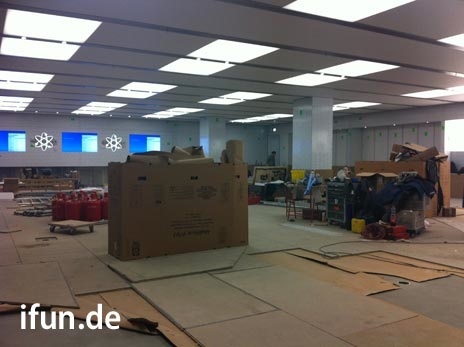 As noted by ifoAppleStore, Apple is poised to end its longest drought of store openings tomorrow when the company opens the doors on its new Altmarkt-Galerie store in Dresden, Germany. The store will be company's first in the city and fifth in Germany and will be the first Apple retail store to open since the University Park Mall store in Indiana opened for business on November 13, 2010, a span of 138 days that beats the previous longest gap of 105 days. Apple opens the majority of its stores in the pre-Thanksgiving period, with a few construction-delayed stragglers before Christmas. Last year's final grand opening was on November 13th at the University Park Mall (Ind.) and none have opened since. The previous record for no store openings was set between January 25, 2003 for the Knox Street (Tex.) store, and May 10th for the Walt Whitman (NY) store. Despite the lack of openings over the past few months, Apple has not been entirely silent on the construction front, with a number of other locations currently under construction. The company has also been pushing forward on renovations and expansions at some of its locations, as evidenced by the Knox Street store in Dallas currently being located in temporary quarters while its permanent home is expanded and renovated and the SoHo store in Manhattan also being set for expansion. For goodness sakes! Open one in London Ontario already.